The Most Entrepreneurial Metropolitan Area? This report is based on federal government data -- available to the public for the first time -- on business startups at the metropolitan area level. By decomposing into four population size classes, this report can provide more effective peer-to-peer comparisons of Metropolitan Statistical Areas (i.e., large vs. large, and small vs. small). The paper compares the trends in 40 metropolitan areas with higher numbers of startups over the past two decades to the significant national downward trend in overall new firm formation starting after 2006. Nationally, the trend reversed and started to recover in 2011. No metropolitan area escaped this downward trend, but there are differences among regions in the timing of the downturn and subsequent recovery. The paper demonstrates that Metropolitan Statistical Areas of different locations and sizes can have similar measures of startup density. Surprisingly, many of the MSAs that performed well in the evaluation are not commonly thought of as significant locations of startup activity. The largest MSAs -- those with populations greater than 1 million -- fared slightly better through the recession and have experienced slightly stronger recoveries, though none has returned to pre-downturn levels. 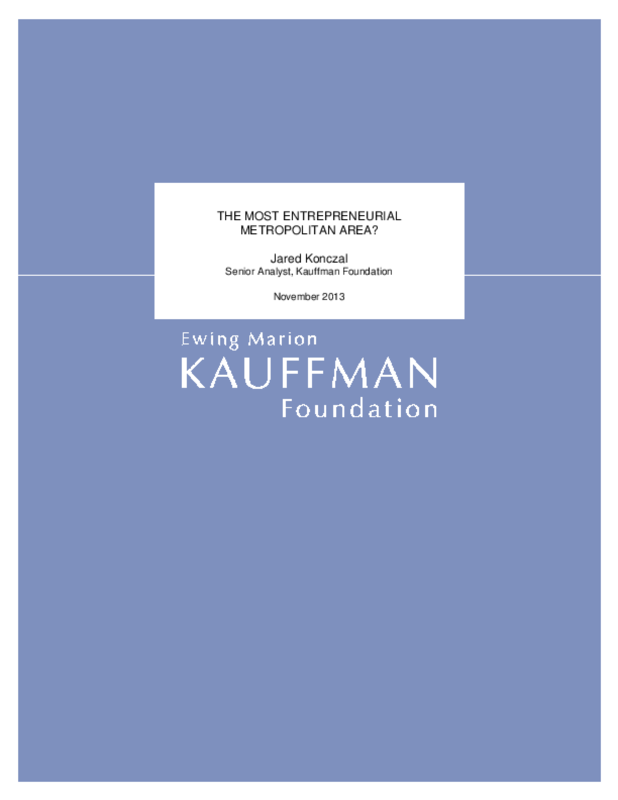 Copyright 2013 Ewing Marion Kauffman Foundation. Title: The Most Entrepreneurial Metropolitan Area?